The final evening of the inaugural Royal West came to a close with Elizabeth Gingras and Zilversprings winning the first annual $100,000 Spirit of the West CSI3* Cup presented by Big Interactive and C&V Portable Accommodations. Fresh off of their Thursday evening win in the Miller Thompson FEI Classic, Zilversprings and Gingras put in a confident fast double clear ride over the technical and fast paced track set by course designer Werner Deeg. The field of twenty-seven horses squared off with only six jumping clear and making it into a fast paced jump off. The daunting track caught many of the riders at the beginning of the class as fifteen horses jumped the first round before a clear round ridden by Tamie Philips and Cat Balou. Gingras trains with Canadian Olympian, Jill Henselwood alongside her other FEI student Jaclyn Duff. 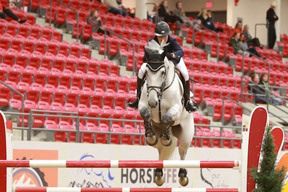 Henselwood came to the Royal West to prepare her team of horses, and riders to compete successfully indoors in International FEI competitions. Royal West President John Anderson finished second in the class by just a fraction of a second aboard Terrific. The Leading Canadian Rider award, was based off of the combined results over the two weeks. Based off of the points of the combined six FEI classes John Anderson and Terrific won the leading Canadian rider title and the prize; a Ford Escape. With fantastic feedback from the riders, and a long two weeks of managing his own Tournament, as well as competing in it; John was blown away by the overall success of the event. With the addition of the Longines World Cup Qualifier, to the Royal West, in the next three years coming, the Tournament is going to become a destination for International FEI competition. The RMSJ team would like to thank our generous sponsors, our exhibitors and everyone who made the event possible.